My forays into the Japanese Drape Drape books seems to be here to stay. After a successful review and giveaway of Drape Drape 2, Laurence King Publishing asked me to review their English translation of the original Drape Drape . And, as I’m sure all of you have by now realized, I review something by actually using it. A local sewing friend commented this week that I am sure doing a lot of work for a free sewing class, referring to my Sundays with Sandra series. I replied that I’m going through the class week by week because I’ve figured out that’s what works for me with online video classes. Without self-imposed mini-deadlines, I wouldn’t finish the class. It’s being free was simply a bonus. If I’m going to take something or review something, I want to be able to say I tried it out. 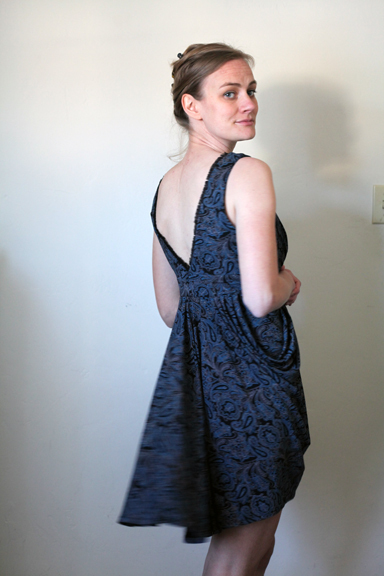 So, in order to really feel like I had reviewed Drape Drape in my own way, I decided to make No. 5 V-Neck Drape Drape Dress. All the versions in the book and online (that I could find from a quick search) were made with a solid knit, but I had my heart set on playing up a print. 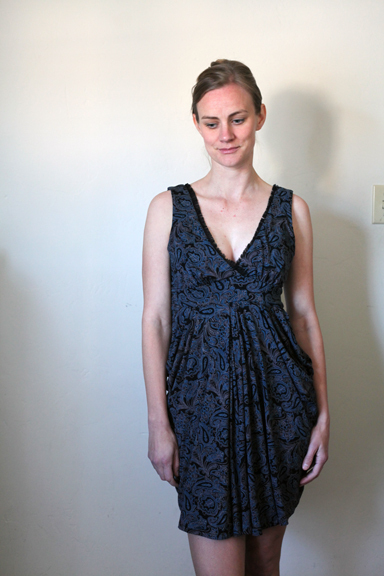 I found this midnight paisley and the fun little trim I used around the neckline at Fine Fabrics, a fabric store that carries some exquisite fabrics. I thought the muted colors would echo a solid while still offering me the pattern play I wanted. 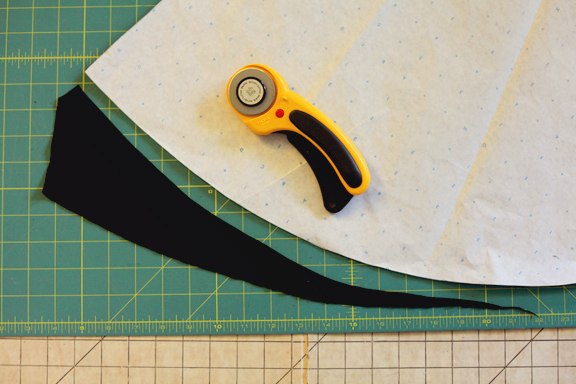 My first hiccup occurred after I traced off the pattern pieces and pre-shrunk my fabric. My print demanded that I cut the skirt pieces in the same direction, but I couldn’t get the pattern pieces for the skirt to fit on the fabric no matter what I did. The instructions suggested you lay your pattern pieces so that their grain line was on the cross grain, an impossibility with my print yardage. I wouldn’t have had any problem had I used a solid knit, but, no, in my infinite wisdom I needed a print! My first solution was to fold back a tiny corner from the back center seam. My intentions were to add this piece back on, but I quickly realized I wasn’t quite happy with how the pieces hung with the extra seam, even though it was just a teeny tiny little thing. As drafted, the skirt is longer in the back than in the front. After thinking over what I wanted to do, I ultimately ended up cutting off the extra few inches from the back using the front pattern piece as my template. This adjustment means my Drape Drape dress is just as long in the front as in the back, but I don’t think anyone but me will ever miss the design feature. It’s still nice and swingy! In fact, there’s so much fabric in the skirt that the whole skirt is super swingy! That’s quite a lot of fabric! It’s no wonder my piece wasn’t wide enough, right? This drape action at the side creates most of that excess fabric and highlights my second hiccup in the making of this dress. In showing off my infinite wisdom again, I had the brilliant idea to serge the skirt on to the waist band, pleats and all. I of course caught these beautiful side drapey drapes in the serger a bit funny, making them go ever so slightly wonky. There was no way to pretend the result was another design feature that would go unmissed. I tried to take my seam ripper to the offending bits, but I just couldn’t salvage it. Instead, my shears came out, I cut off the entire serged seam and started over. This time I used my regular sewing machine to attach the skirt to the waistband, and all went perfectly. 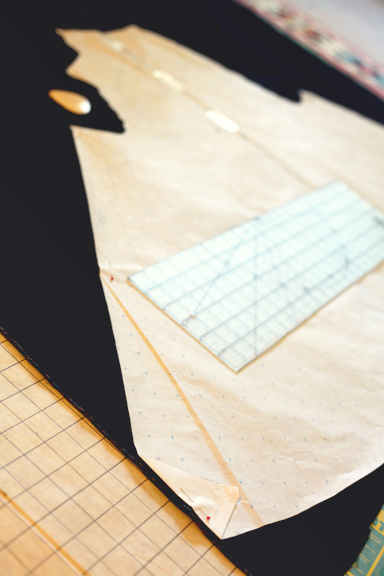 The result is a waistband and skirt that are each 1/2″ shorter than they should be, making for 1″ of missing dress. At least a slightly shorter dress is a design feature that no one will really notice except me, which I can live with! The empire waistline in all its glory. But, oh, those drapes! Anything for those drapes! 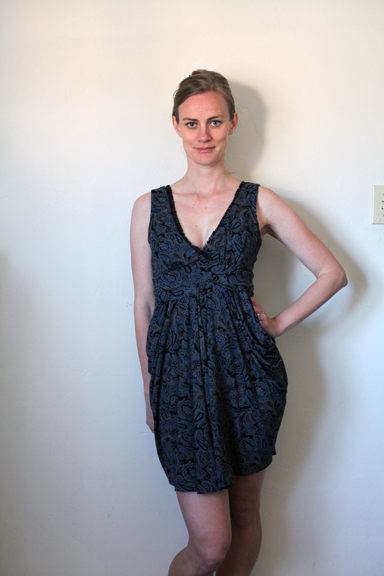 Though it’s hard to get a close up without being a bit too risque, I added a bit of trim to the neckline. It was my first time working with any sort of trim. Can you believe I’ve never added piping to anything?! It was as easy as I imagined it would be, and I quite like the little flecks of black adding a bit of unexpected flare to the dress. Now for the best part – the giveaway. Laurence King Publishing has agreed to give away an additional copy of the English version of Drape Drape to one of my readers. Add a little swing to your 2013. If you’d like to be entered into the drawing, just leave a comment below letting me know. I’ll pick a winner at random next Saturday, February 16th at 7 am PST. Good luck! The fabric & trim are just beautiful & it looks fabulous on you! I would love to try this pattern!!! Please enter me in the giveaway. I’d love to have a copy of the English version of Drape Drape. 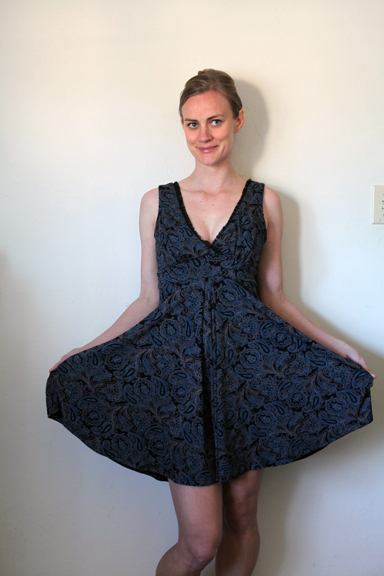 Awesome dress – well sewn 😉 … Please enter me in the giveaway, the book looks fantastic. I love your dress, and it looks gorgeous on you! Please enter me in the giveaway for the book. I want to make a dress like that! And, I love the paisley. I always drool at that book when perusing Amazon. Too win it would be the cat’s meow! The dress looks beautiful! I would love to win a copy of the book! I love the paisely dress on you. The colour is so nice! I would love to win a copy of the book Drape Drape! Please include me in your contest. I love the print! The dress is beautiful. What a lovely dress! Count me in for the book giveaway! Thank you! What a beautiful rendition of this pattern. I’d love to go into the draw to win the book – and maybe make the same dress! Love the dress! You did a great job. I’d love to go in the draw please! It looks like such a great book. Lovely dress, I like that you used a print fabric, it works well. It looks lovely! I’m glad to hear I’m not the only one that does things like that :P! thanks for the chance for the book! Oh my! I would love to win the book…. Those side drapes are stunning and I’d really like to try them. Please enter me in the giveaway -it looks like a great book! I love that you review by actually using the book. Your dress is fantastic. Love that swingy, shorter skirt! I love your dress! The print looks fab, great choice and result. I would loooooovvvve to go in the giveaway thanks! That dress looks great on you! I have been coveting that book! I couldn’t even hazard a guess where you’d have hiccups- the dress looks so beautiful! The book seems promising! I’d love to win it. You look fabulous Amy! Hope you’re doing OK! Gorgeous dress, and I love your description of the process. Please enter me into the draw. It looks great, Amy. Very flattering! I’m really blown away by this dress on you Amy – it looks stunning! The drapes are so elegant and that that flash of black at the decolletage… well! Your dress is lovely. I love a bit of swing. Please enter me in the giveaway. Ooooh! This is totes wearable and absolutely stunning! Love it! And I would love to go into the draw- what a lovely offer! You’ve done a fabulous job on this, I love the dark paisley print. I’d love to win a copy of the book, looks like fun! What a gorgeous dress! 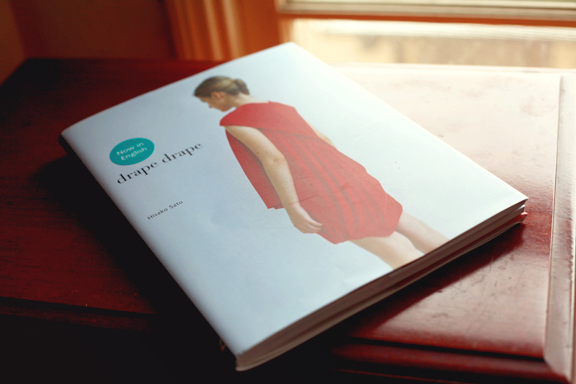 I’d love to win a copy of drape drape – I’ve never tried draping before! Do not knock your infinite wisdom! The dress is awesome. I love the drape and the way the print and trim adds flair. I would love to get a copy of the book so I can see what else can be made. Beautiful dress – I’ve always loved the combination of navy and black. BTW your hiccups are completely unnoticeable! Yes, please put me in the draw – I’ve never read one these books before! It is a lovely dress. Please put me in the drawing, I’ve been intrigued by the books lately! Amy, Your look quite chic in this dress. It’s beautiful and I can’t think of a better reviewer for the book. Thanks for sharing! Wow, what a beautiful dress. I love the “Drape Drape” look of it. I would probably have chosen a print as well and I love sewing with knits. I would love to win this book. You achieved a great review by doing this dress. BTW, the dress looks great on you, good color for you too. Thanks. I adore the dress! I wasn’t sure by the cover if I would like the patterns in this book, but you have convinced me – please enter me in the drawing! The book begins with descriptions of the techniques you’ll need to use to make the included garments. There’s not too much detail, but more than enough to be useful. I always make sure to read through all of those pages before I make my way through the rest of the book. The dress that I made, No. 5, has 17 steps that all fit on less than a half of the page! Most are self explanatory, such as “2. Sew the darts in the front lining”, while others come with a descriptive line drawing. I will admit that I had to read through the instructions for sewing up the armscye several times before I figured out what was going on. There were several detailed photos, but they didn’t help me for parse everything at first. There was an “Ah ha!” moment when everything finally clicked. One clever thing they’ve done is to add the numbers to the line drawings for the pattern pieces and finished dress, so you can see at one glance the order of construction. For me, knowing the right order is half the battle to sewing a garment. If you end up with this book, I think you’ll be just fine constructing any of the garments with the included instructions. 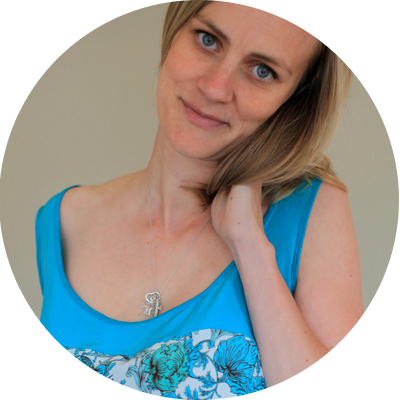 I bet you’d amaze yourself how much you can intuit your way through a garment! That came out so well, a perfect little knit dress, looks like it would be great to pack in a weekend bag and wow people with your chic look on a getaway weekend to somewhere. I would love to get that book. Count me in for the giveaway. I have seen many versions of this draped dress pattern and love them all. You are indeed the first with a print that I’ve seen. Bravo! I would love this book! I love your version; it’s definitely inspired me! The print looks good! I love the skirt on the dress. I’d love to win this book. Please enter me in the drawing, your dress is inspiring and I’d love to give it a try! Really love your blog. Drape drape I would love to receive to follow your inspiration. I’ve always liked this dress, but you’ve really brought this to a new level using paisley fabric. I too have only found these drape dresses being done in plain knits and it’s fun using other fabric. Love it. I’d love to win a copy- your dress is gorgeous and the print looks great with the pattern! Great fabric for this design. It really gives the dress a different look but doesn’t take away from the drapes. I’d like to be included in the draw, I’ve been wanting to try one of these books for a while. I love, love, love the knit print and the way the dress hangs is just lovely. I looks so comfy to wear. Draping is a real art and I’d like to add this to my sewing skill set – the book would be a great start. Thanks so much. you know i feel a rocky path with a happy ending. gorgeous, amy! I really need to check out this book. Your dress epic. WOW!!!! Your dress is beautiful and I love the draping!!! The style (and fabric) really suits you! I look forward to every new post and this one was an inspiration.. I would love to be entered in your contest. This looks like a very interesting book! I’m so glad I’m not the only one who gets things bunched in the serger sometimes. You corrected it beautifully, can’t tell there was ever a problem. Please enter me in the giveaway! Fabulous! I’m about to tackle my first project with a knit, and this dress already has me planning the next one! Beautiful dress. And I’d love to be entered in the giveaway! would love a copy of drape drape and your dress is fine! Please enter me into the giveaway. Your dress looks amazing! I can’t wait to try the patterns. Of course I whould have never known you made any mistakes if you had never mentioned them. 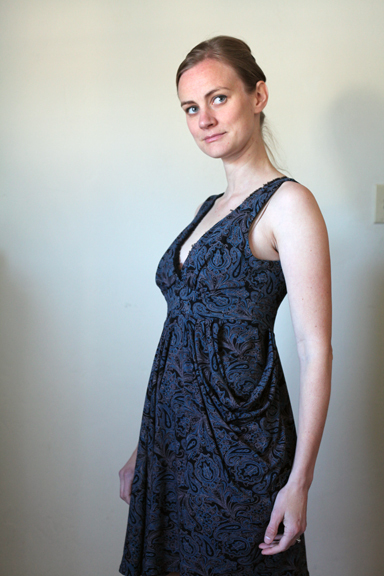 The dress looks great in the paisley, I’m partial to prints myself so it’s good to know it works. I have the Japanese version of this book & have never been brave enough to try any of the patterns but if I had it in English I would try out several. I love this dress! The print is perfect, glad you trusted your instincts! I’m really into complicated jersey dresses lately, so I’d love to take a look at this book. Thanks for hosting the giveaway! Gorgeous dress. I first saw it over at cation designs’s blog and I can’t decide whose I like better 😉 Tie! I remember the top part of the skirt being a bit tricky. I folded the pleats into place and pinned it to the top to make sure the draping was correct. I’ll be honest and admit that the first two times I basted the top to the skirt, I got it wrong! And, the first time I’d serged, not basted, so I lost some length when I had to cut off that seam. The second time I definitely basted and just unpicked the parts that weren’t draped quite right. In the end I decided I needed to leave a few inch holes hidden behind the shortest pleats that are centered over the hips, if that makes any sense. You can’t see the holes at all, but I can stick a couple fingers through the skirt! Leaving those holes open and not pinned up into the skirt seam really helped the draping turn out nicely. 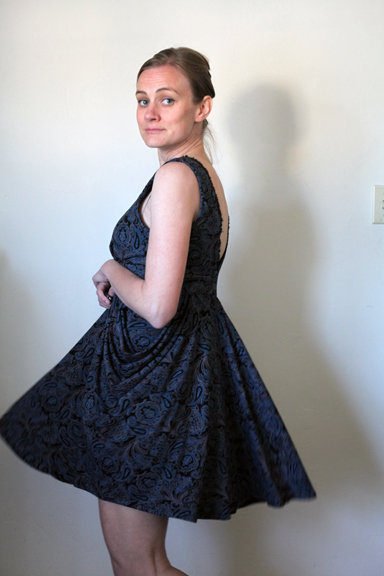 I imagine I could have sewn them shut, but at that point I was just happy to have the skirt successfully basted to the dress and ran it through the serger. I used a really nice jersey, so it won’t unravel!